SSE has confirmed it is merging its British domestic business with Npower to form a new energy company. SSE, the UK's second-largest energy supplier, which also reported a big fall in its adjusted pre-tax profits of 13.9% in the six months to September, revealed the merger talks on Tuesday. The deal knocks the country's "Big Six" energy firms down to five. "We are very proud of what we've delivered over many years," said chief executive Alistair Phillips-Davies. He said the merger would allow both to "focus more acutely on pursuing their own dedicated strategies". The new firm is expected to be roughly the size of market leader British Gas and to serve about 11.5 million customers. 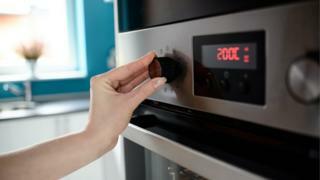 The news comes less than a month after the government published draft legislation to lower the cost of energy bills. However, SSE retail's chief operating officer, Tony Keeling, denied that was the reason for the merger. "We've been looking for well over a year about what we should do," he told BBC Radio 4's Today programme. "We've listened to government regulators and customers and understand that the market needs to transform and we're absolutely committed to doing that. "By merging SSE's retail business with Npower's retail business to form a new organisation, we think we can be more efficient, more agile and more innovative for customers." The deal could fall under the jurisdiction of the Competition and Markets Authority if it progresses beyond its current stage, but Mr Keeling added: "We think it is very good for competition and customers. There are over 60 people competing in the market and if you look back to 2011, there were only eight." Innogy's chief executive officer, Peter Terium, agreed the price cap was not the reason for the merger but did concede it may "have pushed it a bit quicker". He added that while "great progress" had been made in restructuring Npower over the past two years, "it is clear that Npower would be better placed to offer value to our customers and our shareholders as part of a new company". SSE's shareholders will hold 65.6% of the new company, with Innogy, which owns Npower, holding the rest. Innogy will also receive a break fee of £60m if SSE's shareholders fail to approve the deal by 31 July 2018. In a statement, SSE said the new firm was expected "to deliver enhanced value" and that savings in costs and combined IT platforms would "ultimately enable the company to be an efficient competitor in its markets". It added that no final decision on the implications for employees would be taken without talks with their representative bodies. Mr Keeling added: "We're proud of our track record in customer service and have plenty to build on. "But there is a huge amount of competition and we need to do more than ever to compete by providing value for money and excellent experiences for customers. "We have an exciting opportunity to create a major new independent supplier with a single-minded focus on customers." Meanwhile, regulator Ofgem has welcomed SSE's announcement that its electricity networks division will make a voluntary contribution of £65.1m to consumers.